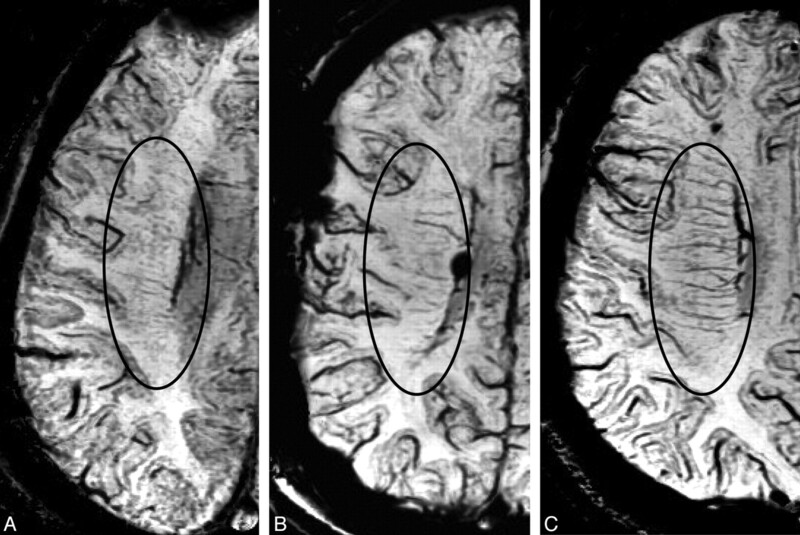 BACKGROUND AND PURPOSE: SWI is a high spatial resolution MR imaging technique showing magnetic inhomogeneity that could demonstrate increased oxygen extraction in focal cerebral ischemia. The aim of this study was to investigate the characteristics in the signal intensity of DMVs by using SWI and to determine whether this method could indicate the severity of the hemodynamics in MMD by evaluating the correlation between SWI stage and hemodynamics on SPECT. MATERIALS AND METHODS: Consecutive MMD patients were prospectively analyzed before treatment. Routine MR imaging including SWI was performed, and the number of the conspicuous DMVs draining into the subependymal veins was classified: stage 1, mild (<5); stage 2, moderate (5–10); and stage 3, severe (>10). The SWI stage was evaluated in correlation with clinical presentations, and CBF and CVR were quantified by using a SPECT iodine 123 N-isopropyl-p-iodoamphetamine split-dose method. RESULTS: Patients were 12 males and 21 females (range, 8–66 years), consisting of 4 asymptomatic patients, 13 patients with TIA, 9 patients with infarct, and 7 patients with hemorrhage. There was a significant difference in CVR among clinical presentations, though there was no difference in age, Suzuki stage, or CBF. Conversely, SWI stage was significantly higher in patients with TIA and infarct than asymptomatic patients (P < .01). Higher SWI stage significantly had lower CBF and CVR in the middle cerebral artery area (P < .05). CONCLUSIONS: SWI stage strongly correlates with ischemic presentations in MMD and also correlates with hemodynamics on SPECT, especially CVR. Increased conspicuity of DMVs, known as “brush sign”, could predict the severity of MMD. Recently, the advancement of MR imaging modalities has enabled to investigators to evaluate small venous structures and iron in the brain. In particular, SWI has been accepted as a method available to evaluate deep venous flow in acute or chronic ischemia and to demonstrate increased oxygen extraction in focal cerebral ischemia.8 Here, we first describe the characteristics of the signal intensity of DMVs by using SWI. We then determine whether this SWI could be used to assess the severity of the hemodynamics in MMD by evaluating the correlation between SWI stage and hemodynamics, including CBF and CVR, on SPECT. From April 2006, 33 patients with MMD were prospectively analyzed as a preoperative assessment in this study. The patients were diagnosed with MMD according angiographic findings9: stenosis or occlusion is present at the terminal portions of the internal carotid artery or the proximal areas of the anterior cerebral artery and MCA, and there are abnormal vascular networks in the arterial territories near the occlusive or stenotic lesions, detected by MR angiography and intra-arterial angiography. The patients underwent preoperative MR evaluation, including SWI and hemodynamic study by using SPECT. Control SWI data were obtained from 10 healthy volunteers (mean age, 42 years; range, 33–52 years). All patients underwent intra-arterial angiography to confirm Suzuki's staging of MMD, to evaluate collateral supplies to the affected area and development of the STA as a donor vessel for direct bypass surgery. Brain MR imaging was obtained on a 3T system (Signa Excite HDx; GE Healthcare, Milwaukee, Wisconsin) by using an 8-channel brain phased array coil. We acquired SWI contrast by using a PSI technique with a 3D gradient recalled acquisition in the steady state (TR, 44ms; TE, 30ms; flip angle, 20°; FOV, 20 cm; matrix 320 × 192; section thickness 2 mm). The PSI generates susceptibility contrast computed by multiplication of the phase and magnitude images. The PSI was postprocessed by using a high-pass filter and then converted into negative phase masks that were multiplied 4 times into the corresponding magnitude images by use of Windows-based research software (PSI Recon; GE Yokogawa Medical Systems, Tokyo, Japan). We analyzed PSI-based SWI with a minimal intensity projection to display the processed data and contiguous 6-mm-thick sections with 3-mm overlap in the transverse plane. We also performed SPECT procedures according to the split-dose method protocol.6 SPECT was performed by using a triple-head gamma camera (PRISM 3000; Picker, Cleveland, Ohio) equipped with a high-resolution fan-beam collimator. The data acquisition protocol was a 120° rotation with a 3° step and an acquisition time of 30 seconds per step. All images were reconstructed by filtered back-projection by using a Ramp filter, and attenuation correction by using the Chang method was applied. A 64 × 64 image matrix was used for the data acquisition and display. During the dynamic SPECT of 24 frames (1 frame took 2 minutes 30 seconds), 111 MBq of 123I-IMP (Nihon Mediphycs, Tokyo, Japan) was intravenously injected at the start of imaging, and 20 mg/kg acetazolamide (Diamox; Sanwa Kagaku Kenkyusho, Nagoya, Japan) was thereafter slowly injected intravenously over a 1-minute period at the fourth frame (9 minutes after the initial 123I-IMP injection). An additional 111 MBq of 123I-IMP was injected at the 10th frame (25 minutes after the start of imaging). Continuous arterial sampling with the octanol fraction at a constant speed of 1 mL/min for 5 minutes was started 30 seconds before the first frame and then was stopped 30 seconds after the second frame. A region of interest was set up in the cortical MCA, basal ganglia, and thalamus. The area of infarction or hemorrhage was excluded from the field of region of interest. Two perfusion images, namely, the resting and vasodilated images, were obtained with the subtraction technique. The following equation was used to estimate the percentage increase in CBF (milliliters per 100 g per minute) induced by acetazolamide challenge in the form of the CVR: CVR = values formulated (acetazolamide challenge SPECT count − resting SPECT count)/resting SPECT count (percentage). With the SWI method, we focused on the DMV, which drains into the subependymal veins. The number of the conspicuous DMVs was classified as follows: stage 1, mild (<5); stage 2, moderate (5–10); and stage 3, severe (>10). Representative images are shown in Fig 1. Two independent neuroradiology (M.M.) and cerebrovascular neurosurgery (N.H.) experts, who were blinded to the patients' clinical and radiologic information, evaluated all images. Each reader evaluated the patient images separately and independently. Statistical agreement, Cohen κ, was calculated to determine agreement between readings (IBM SPSS Statistics 15.0, SPSS Japan, Tokyo, Japan). Interpretation of the κ statistics was based on the following scheme: 0–0.4, poor agreement; 0.4–0.7, good agreement; and >0.7, excellent agreement. Statistical analysis of the data was performed with 1-way analysis of variance and post hoc analysis by using Tukey-Kramer multiple comparison test (Instat, Version 3.05; GraphPad Software, San Diego, California). Differences were defined as significant at a probability level of P > .05. Representative images showing SWI stages according to the number of conspicuous DMVs draining into the subependymal veins: stage 1, mild (<5; A); stage 2, moderate (5–10; B); and stage 3, severe (>10, namely “brush like”; C). SWI staging (A), CBF (B), and CVR (C) in each presentation type of MMD. *P < .05. Between April 2006 and August 2010, 33 patients with MMD (12 males and 21 females; mean age, 31 years; range, 8–66 years) were registered into the study. Patient characteristics are summarized in the TableA. They consisted of 4 asymptomatic patients, 13 patients with TIA, 9 patients with infarction, and 7 patients with hemorrhage. Regarding Suzuki angiographic stages,1,2 29 patients were in stage 3 and the remaining 4 patients were in stage 4. Although a difference in CVR among the clinical presentations was detected, there was no difference in age, Suzuki stage, and CBF (Table). The DMV runs from the frontoparietal cortex down to the draining subependymal vein near the lateral ventricle, and these are normally difficult to identify radiologically. In ischemic MMD, however, DMVs are easily identified. The interrater reliability (Cohen κ) for SWI stage was calculated as 0.66, which is considered to represent substantial agreement. The SWI stage was significantly higher in patients with TIA and infarct than in controls, asymptomatic patients, and patients with hemorrhage (P < .05 versus control, asymptomatic, or hemorrhage; Fig 2A. The SWI stage in the control subjects was similar to that of the asymptomatic subjects (Fig 2A). In addition, CVR was significantly lower in the patients with TIA and infarct than in the asymptomatic patients (P < .05; Fig 2B, -C and Table), though there was no significant difference in CBF among groups. Interestingly, SWI stage and CBF were similar between asymptomatic patients and patients with hemorrhage and CVR in patients with hemorrhage was not severely impaired, which was different from that of the TIA and infarct groups. We next assessed the correlation between SWI stage and hemodynamics (CBF and CVR) on SPECT (Fig 3 A–F). 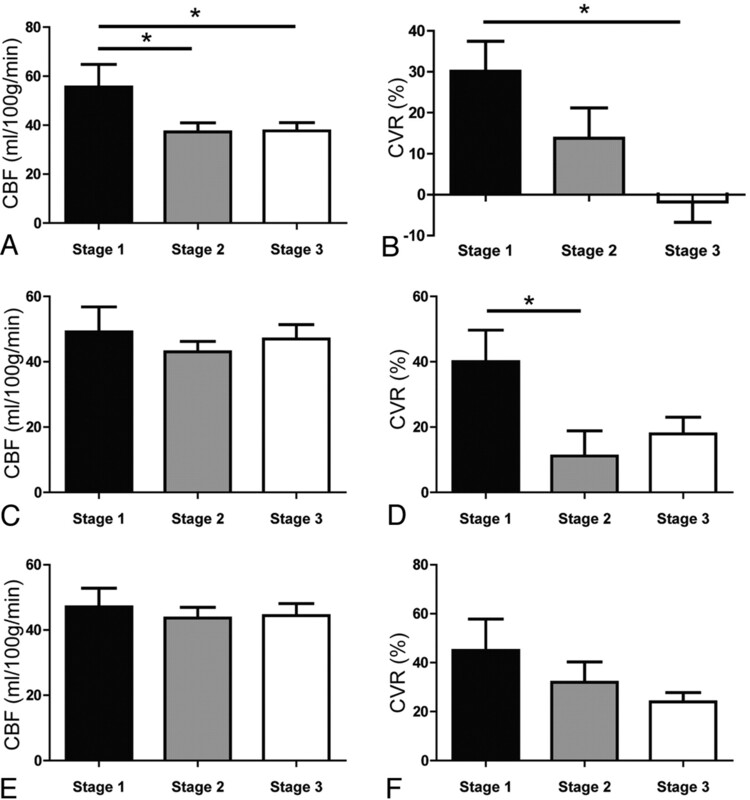 This clearly showed that CBF was significantly higher in SWI stage 1 than stages 2 and 3 in the cortical MCA area (P < .05; Fig 3A) compared with in the basal ganglia (Fig 3C) and thalamus (Fig 3E). In contrast, CVR was significantly lower in SWI stage 3 in the cortical MCA area (P < .05; Fig 3B), and a similar trend was seen in the basal ganglia (Fig 3D) and thalamus (Fig 3F). CBF (A, C, and E) and CVR (B, D, and F) in each SWI stage. The region of interest was located in the cortical MCA area (A and B), basal ganglia (C and D), and thalamus (E and F). *P < .05. Images from cases from the study are shown in Fig 4 . A, 37-year-old man showing infarction in the right occipital lobe. B, Intra-arterial angiography showing Suzuki stage 3 MMD. Brush signs can be seen in the deep white matter on SWI (C) with low CBF (D) and CVR (E) on SPECT. 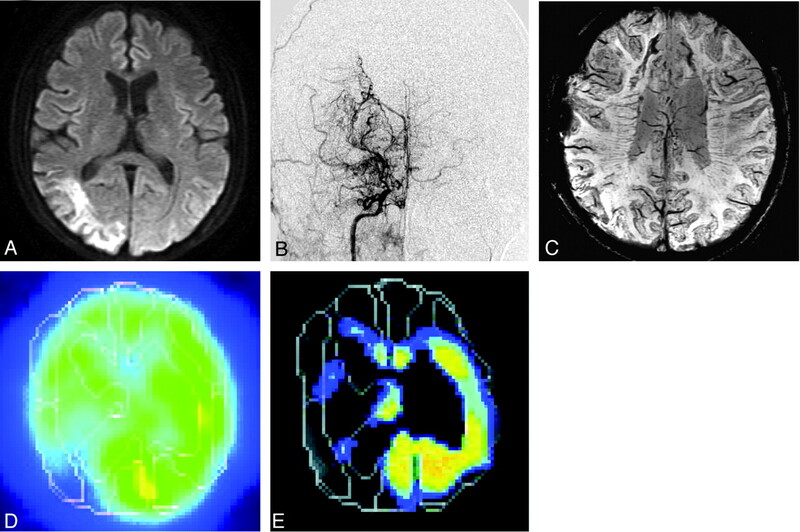 In MMD, increased conspicuity of DMVs was found in patients with TIA and infarct, implying that impaired perfusion occurred in the deep white matter. This result supports the specification that conspicuous DMVs indicate increased oxygen extraction or venous stasis, and this indicates a part of misery perfusion in this area.8,21 Susceptibility-weighted MR imaging shows prominent hypointense signals in the draining veins within areas of impaired perfusion. Therefore, this would account for the increased visibility of veins in these regions, making it valuable to anticipate the extent of impaired perfusion in MMD without contrast-enhanced CT or MR imaging, SPECT, or PET. Alternatively, DSC-weighted bolus tracking MR imaging and ASL are the latest additions to the growing number of techniques available for quantitative hemodynamic analysis.5 ASL is becoming more clinically relevant for evaluating CBF because this method has other advantages, including lack of radiation, lack of intravenous contrast agent, and the ability to repeat the study. In terms of MMD, however, the delayed arterial times through collateral pathways can cause a significant underestimation of CBF as well as errors due to labeling agent that remains in the feeding vessels rather than being extracted into the brain parenchyma.4 Moreover, patients with MMD are in a chronic state of cerebral vasodilation and have a reduced or absent CVR. Therefore, CVR is also a valuable hemodynamic indicator in MMD, though there have been no MR imaging techniques reported for the assessment of CVR so far. Here, we first show SWI could correlate with hemodynamics in SPECT, especially CVR. Another interesting finding in this study is that SWI stage and CBF and CVR were not so impaired in patients presenting with hemorrhage compared with those presenting with TIA or infarct. Intracranial hemorrhage is a common in feature in adult patients with MMDs with a mortality rate of approximately 20%, and it is the largest risk factor contributing to the poor prognosis with this entity.22,23 Hemodynamic stress to the Moyamoya vessels has been suggested as a cause for the hemorrhagic presentation, and some reports showed Moyamoya vessels and aneurysms associated with MMD resolved after bypass surgery.24,25 The prophylactic effect of bypass surgery against cerebral hemorrhage remains uncertain, and this issue will be clarified by a prospective, randomized trial in Japan (Japan Adult Moyamoya Trial). Here, we showed severe hemodynamic compromise was not obvious in the hemorrhagic group. Although there is less consensus regarding the hemodynamic findings in hemorrhagic MMD, some supportive reports have so far shown that CBF in MMD is not significantly lower in any presentations and that there is a significant difference in CBV and OEF between the patients with ischemia and hemorrhage, with a higher CBV and increased OEF (lower CVR) in the ischemic group.26,27 Moreover, the disturbances in cerebral hemodynamics are usually less prominent in adults with MMD than in pediatric patients.28,29 Together, this suggests that hemodynamic impairment does not always contribute to the hemorrhagic presentation, which is common in adults. The SWI technique also can detect MBs, reported to be a predictor for hemorrhage in MMD.30 MBs were detected in 18.8% (3 in hemorrhage groups and 3 in TIA groups) in our series. The incidence of MBs is reported as 14.8%–42%, depending on MR imaging quality such as 1.5T versus 3T or T2* versus SWI technique.31–33 The significance of MBs in patients with an ischemic presentation is still controversial. Kikuta et al32 reported MBs occurred with equal probability regardless of the MMD onset type (44% in hemorrhage versus 43% in ischemia). In contrast, Ishikawa et al33 reported that patients with hemorrhage had more MBs than those with ischemia (33.3% in hemorrhage versus 11.1% in ischemia). Initially, the characteristic clinical feature of MMD suggests that a patient could have both ischemic and hemorrhagic stroke, and 13% of patients with MMD with hemorrhage have experienced ischemic attacks before admission.34 Further study is necessary to determine whether MBs are specific for a hemorrhagic presentation. Several limitations in this study should be addressed. First, this study was performed as a preoperative study and did not interpret SWI data for decision making for revascularization surgery. Second, we could not characterize the signal intensity change of the DMV on SWI after revascularization surgery. Therefore, the utility of SWI to predict whether a patient with MMD would benefit from bypass surgery is still not clear. In our institute, the main indication for revascularization surgery was symptomatic MMD and asymptomatic MMD with impaired hemodynamics (lower CBF and CVR) when evaluated by SPECT. Direct and indirect combined bypass surgery (STA-MCA anastomosis with encephalomyosynangiosis) was mainly performed for the patients with MMD, and indirect bypass surgery (encephalo-duro-arterio-synangiosis) was selected in case the STA was not developed. In this study, direct and indirect combined bypass was performed in 17 patients, indirect bypass was performed in 3 patients, and 13 patients were treated conservatively. More data should be accumulated by using SWI to address these limitations. Third, this study was not a quantitative analysis and SWI could not replace other modalities for the assessment of the cerebral hemodynamics. Nevertheless, SWI could be a simple and powerful technique to assess CVR in MMD without acetazolamide challenges. In this study, we found that SWI stage strongly correlates with ischemic MMD and also correlates with hemodynamics in SPECT, especially CVR. Increased conspicuity of DMVs known as “brush sign” with SWI could predict the severity of MMD. This work was supported in part by a Nagasaki University President's Fund grant. Accepted after revision January 14, 2011.